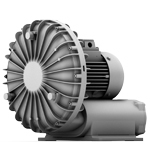 Elektror, founded in 1923, is a leading international supplier of industrial radial blowers with capacities up to 600,000 m³/h and side channel blowers for pressure zones up to 750 mbar total pressure difference and volumetric flow rates of up to 2.310 m³/h. Today Elektror has about 250 employees at its headquarters in Ostfildern, its manufacturing locations in Waghäusel and Chorzów (PL) and at numerous service and sales locations all over the world. Because of the wide-ranging applications for air, Elektror is represented in nearly all branches of industry and commercial processing. Particular emphasis in our work is placed on suction and drying technology, food and beverage industry, climate control and water technology, environmental technology, conveyor technology, the textile industry, packaging and printing. In these areas, we work together with the market leaders to define the performance criteria for the present and future and thus ensure our common success. The companies distribution, administration and development are based at the company headquarters in Ostfildern near Stuttgart. The production of aluminium cast blowers, (stainless) steel blowers and side channel blowers is located in Waghäusel near Karlsruhe. The production of large-large volume steel fans is located in Chorzów, Poland. The new, ultra-modern production plant built in 2003 is designed specifically to meet the needs of Elektror and have been expanded in 2014 with further 3,600 m² to a production area of now approx. 10,200 m². Precisely calibrated processes enable Elektror to ship all standard products within 5 days of order receipt. Customer-specific designs are delivered within of 15 days. This sets the standard in our industry. For a PDF Catalog please contact us. Cast aluminum blower housings, impellers made of galvanized steel sheet, maintenance-free squirrel cage rotor motors to IP 54. 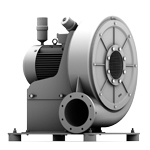 The blowers can be supplied in clockwise or anti-clockwise rotation. On demand speed variable execution, 2-step speed variable, step less with single phase, or speed variable execution by frequency converter. A variety of accessories for the Elektror ND blowers include fine filters, connectors and throttle valves, base plate, etc. Cast aluminum blower housings, impellers made of galvanized steel sheet, maintenance-free squirrel cage rotor motors to IP 54. 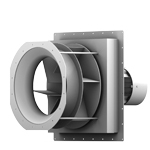 The blowers can be supplied in clockwise or anti-clockwise rotation. On demand speed variable execution, 2-step speed variable, step less with single phase, or speed variable execution by frequency converter. A variety of accessories for the Elektror RD medium pressure blowers include fine filters, connectors and throttle valves, base plate, etc. 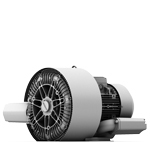 The type of high-pressure fan can be driven from an external source via V-belts. 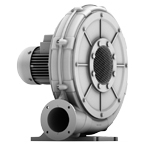 The fan housings made of sturdy cast aluminum and the enclosed impellers are manufactured from aluminum sheet. 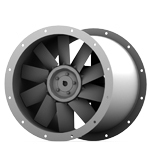 Fans are available with a clockwise or anti-clockwise rotation. A variety of accessories is also available. Special fans for special operating conditions e.g. increased temperatures of the conveyed medium and ambient temperatures, extended corrosion protection, fan sealing. 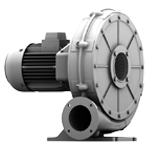 FU/FUK series devices allow the infinitely variable speed regulation of the induction motors used. The speed can be set from 0 to the max. possible speed typical for the device. No derating is required in the entire speed range. In the case of devices in the FUK series, the frequency converter is connected to the motor. The enclosure is IP54. The max. ambient temperature can range up to 60 degrees Celsius. Devices in the FU series require a separate frequency converter. 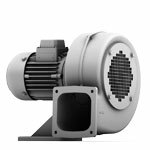 The Electror RD F range of conveyor blowers are radial blowers with welded sheet metal impellers and radial ending blads. They are specially designed for material transport, which is carried out directly by the blower. 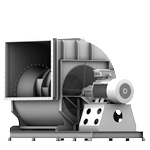 Designed for flow optimisation with corresponding balancing of the impellers guarantees vibration free and low noise operation. All blower parts made of cast aluminum. Non-contact and oil-free rotating impellers. Silencers on inlet and outlet side with base plate as standard. 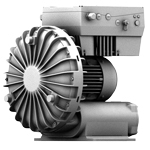 Maintenance-free and performance-adapted squirrel cage rotor motors to IP 54. Various accessories as connectors, welding and threaded flanges, fine filters, pressure and vacuum relief valves and supplementary silencers are available. Reversing units "Reversierautomat" for quick reversal of the air flow from vacuum to pressure operation, with or without neutral position, without reversing the direction of motor rotation. 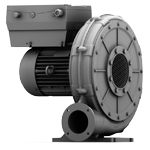 FU/FUK series devices allow the infinitely variable speed regulation of the induction motors used. The speed can be set from 0 to the max. Possible speed typical for the device. No derating is required in the entire speed range. In the case of devices in the FUK series, the frequency converter is connected to the motor. The enclosure is IP54. The max ambient temperature can range up to 60 degrees Celsius. Devices in the FU series require a separate frequency converter, which is normally accommodated in a switch cabinet. Up to 200,000 m³/h (3,300 m³/min) and 2,000 Pa. With direct or belt drive - frequency converter operation also possible. Housing made of steel or stainless steel, impellers made of plastic or aluminium. Fans of this type series are always configured specific to the project. Up to 10.3 m³/min and 750 mbar. Housing and open impellers made of cast aluminium. 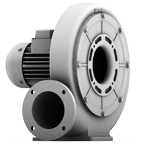 Direct motor, IE2-compliant, integrated temperature guard, integrated silencer, compact construction, mostly corrosion-resistant. Up to 40 m³/min and 21,200 Pa. Wear-free, direct drive via offset frequency converter (FU). Accelerates up to 135 Hz (approx. 8,000 rpm). Housing made of cast aluminium, impellers bent backwards and made out of high-tensile QSTE steel, optionally with automatic after-lubrication mechanism, largely corrosion-resistant. Up to 400,000 m³/h (6,700 m³/min) and 8,000 Pa. With direct, coupling or belt drive - frequency converter operation also possible. Housing and impellers with blades bent backwards and made of steel or stainless steel. Variable connection possibilities. Fans of this type series are always configured specific to the project. Up to 300,000 m³/h (5,000 m³/min) and 5,000 Pa. With direct or belt drive - frequency converter operation also possible. Impellers with blades bent backwards and made of steel or stainless steel. Fans of this type series are always configured specific to the project. 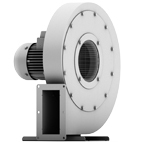 Up to 180 m³/min and 10,000 Pa. Housing made of steel or stainless steel, impellers primarily bent backwards and made of stainless steel or aluminium. In stainless steel execution: Niro-shaft and maximum corrosion-resistance. Variable connection possibilities.